The Victoria Grizzlies are pleased to announce that Nick Guiney has accepted a scholarship to play for Concordia University in Wisconsin next season. Guiney played three seasons, totaling 135 games, with the Victoria Grizzlies. This season, after coming back from injury, Guiney had an impressive second half averaging a point a game, and then continuing his scoring prowess in the playoffs tallying four more goals. “Nick was quietly a great player for our hockey club. 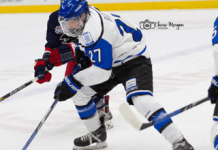 He was a very reliable in all areas, a great teammate off the ice and a guy that can turn it up when most needed, an example being his timely goals in the play offs this season” commented Grizzlies GM/Head Coach Coach Didmon on his graduating player. Didmon is referring to some of Guiney’s heroic goals in this year’s play off run including the Round 2 Game 4 overtime goal vs. Powell River, as well as two games later in Game 6 when he scored both the tying and the winning goal late in the third period to spear head the Grizzlies to game 7 which they won in overtime to take the Island Championship. “Nick was definitely an important player for us and that series showcased his value to our hockey team” added Didmon. The 20 year old West Shore product will join former Grizzlies player Dante Hahn when playing for the Falcons next season. Dante Hahn was co-leader in points for the Falcons last season.